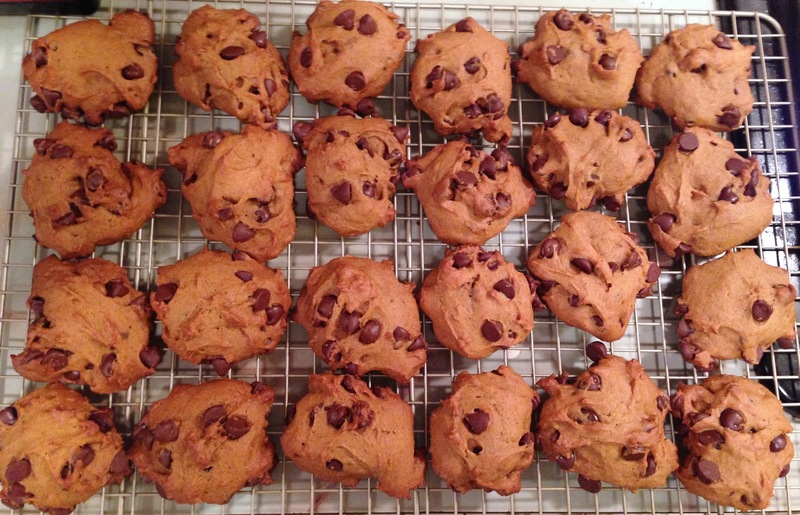 One day, while browsing blogs, I stumbled across a recipe for Pumpkin Chocolate Chip Cookies. It was late September, so I knew it was a perfect recipe for the fall season! I have a thing about trying to bake something every weekend, usually on Sundays, as a dessert for the week (& yummy treat for my roommates). 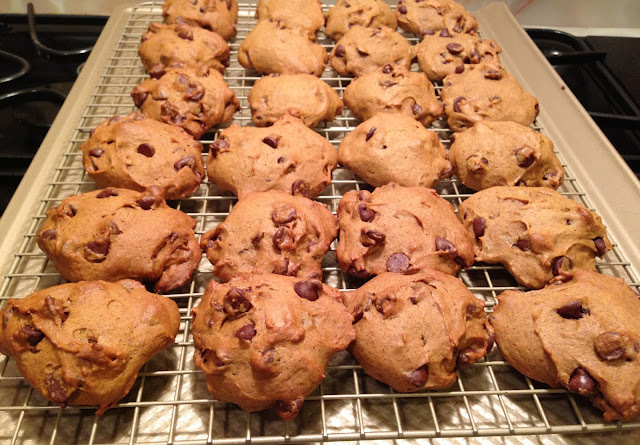 The best thing about these cookies is their cake-like consistency, keeping them nice and fluffy after baking instead of flattening out the way most cookies do. I like mine to have a rich, spicy flavor so I've adapted the recipe a little bit. I've also read great things about substituting applesauce for the oil, I'm going to have to give it a try next time! They're also super quick to make, perfect if you don't have all day to spend in the kitchen. I highly recommend investing in some Goldtouch Baking Sheets from Williams Sonoma if you're in need of new bakeware before you start this recipe. They're pricey, but well worth the investment-I use mine several times a month. I've made these a couple times now, and they don't last more than a day or two. I had a special request from Jessica to make them once she finished her Whole 30 plan in October, so I baked up a batch last weekend & took them to all the girls at brunch on Sunday! 1. Combine pumpkin and sugar. Add vegetable oil and egg. 2. In a separate bowl, mix flour, baking powder, cinnamon, nutmeg and salt. 3. Dissolve the baking soda in the milk and stir into pumpkin mixture. Add flour mixture and mix thoroughly. 4. Add vanilla. Mixture will be very moist, but not runny. Stir in chocolate chips. 5. Drop by spoonful onto cookie sheet lined with parchment paper (can also be a greased cookie sheet). Bake at 365º for approximately 12 minutes or until firm and lightly brown. I fully plan on making another batch for the orphan's Thanksgiving we hold at my apartment every year. Last year, I did a crumb-topped apple pie that lasted all of 15 minutes once it was cut! Pumpkin Chocolate is one of the most famous and delicious cookies our all family love these cookies.